I ended up arriving about 45 minutes late, but I did get a chance to stop by The Gaming Guild to see how +Clifford Holm and his demo was going earlier tonight. I was very pleasantly surprised to see about a dozen guys sitting around a table, each with at least one ship to fly, playing a demo of X-Wing Cliff had created. Most of them were very new or first timers, but I think a couple of them had maybe played a time or two before. 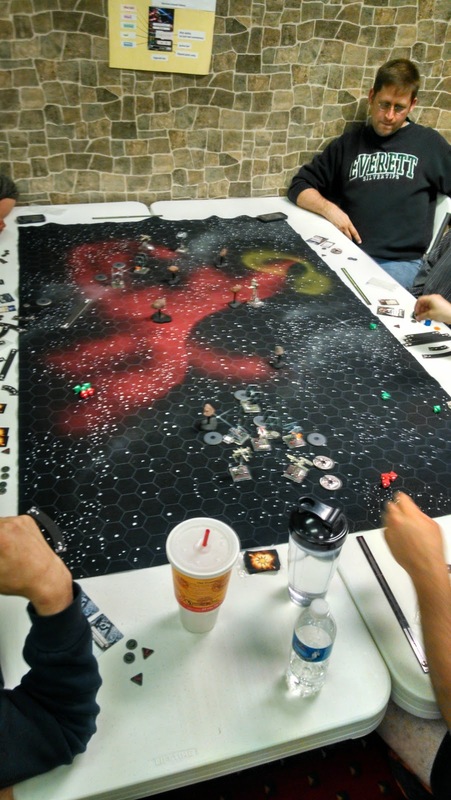 Main reason I mention it on here is Cliff has taken steps to organize an X-Wing league here in Evansville. At the time of writing, we're looking at meeting up at The Gaming Guild on the first Thursday evening of the month and at Comics Quest on the third Thursday of the month. As it was 1 May when this game went down, the next event will be at CQ on the 15th, which I hope to attend on time. I didn't really have a chance to meet or talk to any of the folks in attendance tonight as the game went right up until closing time, but hopefully I'll have a chance to rectify that on the 15th. And big ups again to Cliff for organizing and hopefully mobilizing the Evansville area folks into playing some X-Wing as a group. If you're in the area and want to take part in his league or just stop by to see what all the fuss is about, by all means- come on out!